Coin Falls Casino offers to all veteran British players the chance to increase their chances of winning. On this gaming site, you can receive a 50% reload bonus up to £250. In order to qualify for the deal, you must deposit for the third time at least 10 Pounds. Once you got your funds, you can start gambling. 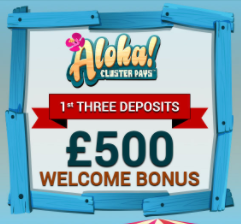 This money is valid only on Aloha Cluster Pays. Play through the deposit and bonus amount 30 times for any cash-outs. The conversion from the bonus funds is limited to 4 times. Get your hands on this amazing offer now!